Teaching your kids about other cultures around the world is an important part of instilling a respect for diversity and tolerance for people who are different from themselves. If you have preschoolers, plan cultural activities for them that introduce them to how other children around the world live. Teach your preschoolers how to say "hello" in other languages. You can start with languages your kids might commonly hear in the United States, such as Spanish, (hola), and French (bonjour). Add a few new languages to learn "hello" in each day, such as German, Swahili, Japanese and Hebrew. Check out the book "Hello World! Greetings in 42 Languages Around the Globe," by Manya Stojic, which provides pronunciations to help you and your child say the words correctly. 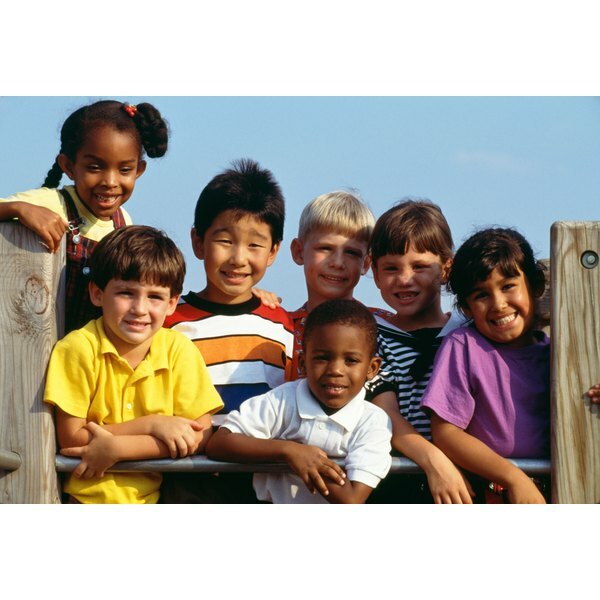 You might also want to teach your child some children's songs that include saying hello in different languages, such as "Hello," from the "Multicultural Children's Songs" CD by Ella Jenkins. Invite your children's preschool friends over to play games that children play in other countries. Feel free to modify games for preschoolers. For instance, you could play statues, or agalmata in Greek. One child who is "it" stands in the center of the play area, closes her eyes and starts counting. She can count as high as she wants. Meanwhile, the other kids must constantly be in motion, running around her. The child who is "it" stops counting whenever she decides, opens her eyes and yells "agalmata!" The kids must then freeze immediately and pose like a statue. The child who is it then goes around trying to make the statues move or laugh by doing something silly. The first person she gets to laugh is the next "it." For another game, from China, have the kids stand in a row with their hands on the shoulders of the person in front of them. The first person in line is the head and the last is the tail. The head must try to catch the tail without anyone getting disconnected. Work on crafts that celebrate children from around the world. Have the kids make a flag hand wreath to represent children from other countries. Print out several full-color maps of other countries onto letter-size paper. Have the kids trace each other's hands onto the maps, then cut them out. Paste the flag hands together in a circle shape, using nontoxic school glue. Hole-punch the top and add a string for hanging. For another craft, you can print out a large picture of the continents. Help your children draw a smiling face of a child on paper in various skin tones from dark brown to light pink. The kids can paste the faces onto the map in different continents. Read books with your preschool-age children that feature children from other countries. One book to check out is "Children Around the World," by Donata Montanari. It has children from various countries discussing their culture and daily life. Another book ideal for preschoolers is "This is the Way We Go To School," by Edith Baer, which uses colorful illustrations to show transportation options for children in other parts of the world. The book "Let's Eat: What Children Eat Around the World," by Beatrice Hollyer, will open your children's eyes to the fact that kids eat different food in other countries.